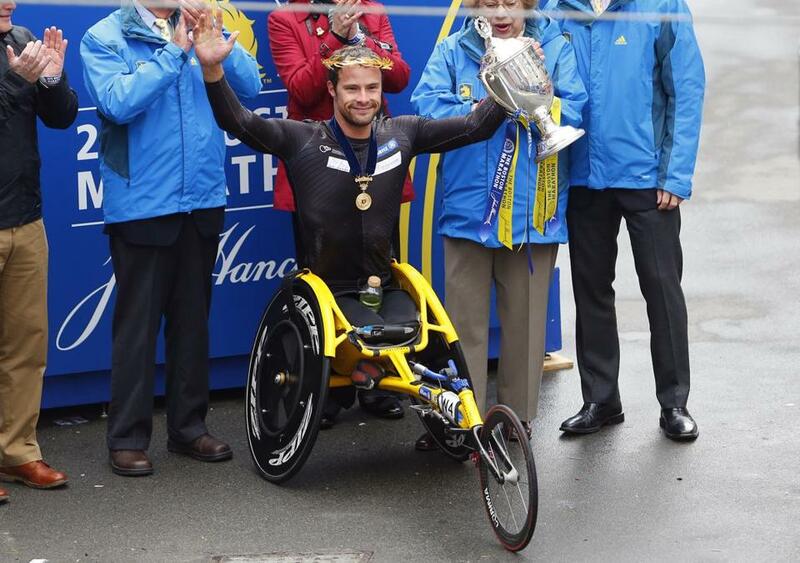 Marcel Hug celebrates his victory in the men’s wheelchair division. Marcel Hug’s strategy for improving on consecutive fourth-place finishes in the Boston Marathon men’s wheelchair race was simple: lock on with defending champion and 10-time winner Ernst Van Dyk. As the Swiss racer passed Wellesley College and neared the halfway point of Monday’s race, that plan was scrapped — not because he could not keep pace with Van Dyk, but because there was nobody else in sight. Hug, who had led a close pack at every interval from the start in Hopkinton, had made his move and opened a 21-second lead, one that only increased as he won the race in 1:29:53. Van Dyk, of South Africa, finished second in 1:36:27 after a final push to edge Japan’s Masazumi Soejima, who was third in 1:36:28. Joshua George was the top American, in sixth place (1:38:15). 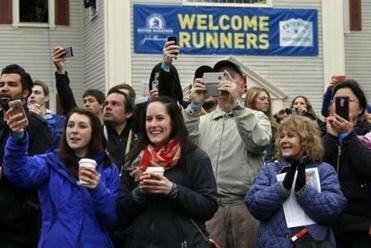 Spectators lined the route of the 119th Boston Marathon Monday, cheering themselves hoarse as legions of runners sped by. “To win here, it’s really special,” Hug said. “I’m proud to win this historic marathon, after taking fourth place last year and winning, it’s a really great feeling. The win was Hug’s fifth World Marathon Major, following victories in Berlin (2011, 2012), New York (2013), and London (2014). On the 40th anniversary of the wheelchair division’s inaugural race, the 29-year-old Hug became the third Swiss competitor to win, joining Heinz Frei (1994) and Franz Nietlispach (1995, 1997-2000). “It’s fantastic to win in Boston because it’s a historic marathon,” he said. Van Dyk, who has won 10 Boston Marathons since 2001, quickly realized that this was going to be a race for second. “At some point we tried chasing Marcel, but it quickly became evident we weren’t going to catch him,” Van Dyk said. As Van Dyk and Soejima neared the finish on Boylston Street, they were neck and neck, glancing at each other in anticipation of deploying their final push. Soejima, who won Boston in 2007 and 2011, appeared to pull ahead, only to see Van Dyk power across the finish line. “My goal was to come from behind in third and pull through, but Ernst is just too strong,” Soejima said through a translator. Van Dyk knew Soejima was right there with him the whole way and was hoping he’d outlast him. Follow Anthony Gulizia on Twitter at @anthonygulizia.